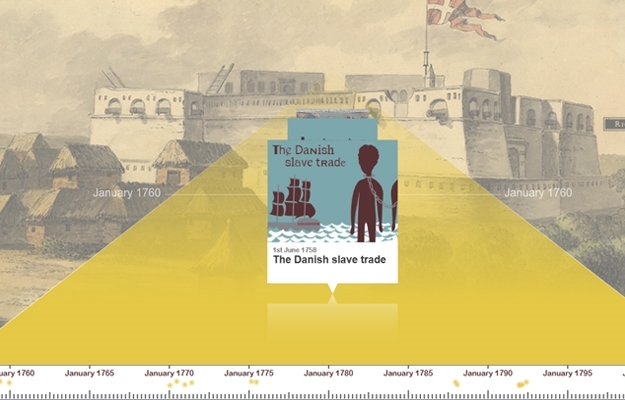 Online teaching material with historical sources about the Danish slave trade. There are sources about the purchase of slaves in Africa, the voyage across the Atlantic, and the slave trade on the three West Indian islands. The material can be used in history teaching in the primary school. You will find historical sources from the Danish National Archives’ large collection of documents from the West Indies on the timeline about the Danish slave trade. These records tell about how slaves were bought in Africa and sailed across the Atlantic to the West Indies. There are also documents about the abolition of the trans-Atlantic slave transport, which Denmark was the first slave-trading nation to decide in 1792. Click on the picture to enter the timeline. You can also visit The West-Indies – Sources of history -a website about Denmark’s 250 years as a colonial power in the West-Indies.